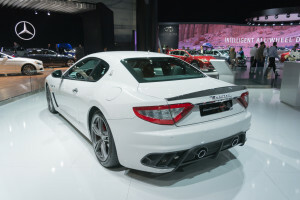 The California Department of Insurance’s effort to spell out precisely how insurers must study labor rates notably treats luxury and exotic collision repairers the same as shops working on the mainstream fleet. Actually, for the purposes of the survey, it treats them like an odd amalgam of the Bureau of Automotive Repair’s shop requirements and the Collision Industry Conference’s 2005 minimum recommended requirements for a “Class A” shop. Following hundreds of complaints about insurers refusing to pay an auto body shop’s rate — often because of outdated collision repair surveys or questionable definitions of market areas, Democratic Insurance Commissioner Dave Jones’ administration has proposed telling insurers precisely how they must survey shops and what counts as a market. “The complaints all allege similar allegations,” the DOI wrote. “When the consumer took their vehicle for repair, the auto body shop billed the consumer based on the work that was done on their vehicle. When insurance covered auto body repair work, the auto body repair shop on the behalf of the consumer engaged with the insurer to settle the labor rate component of automobile insurance claim. However, the complaints alleged that the prevailing rates for many geographic areas fell well below the shop’s actual cost, as the result of unreliable geographic areas that do not accurately reflect the actual labor market, or using outdated surveys. Thus, consumers were forced to pay the difference between the prevailing rates and the actual labor rate charged by the shop or shops were deprived of their reasonably charged rates. California thinks an auto body labor rate market should be six shops. Here’s why. 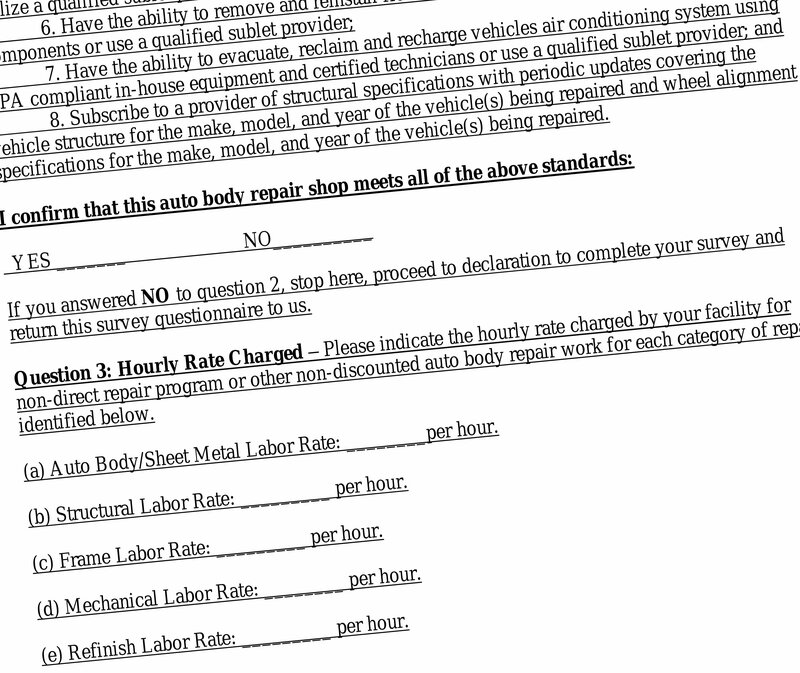 Under the proposal, an insurer can’t pay less than either a collision repairer’s posted rate or the higher of the average or “rate at or below which a simple majority of surveyed shops charge” of the shop’s rate and the nearest five surveyed shops (assuming the insurer conducts labor rate surveys). Shops can still negotiate lower — or higher — rates and direct repair program agreement discounts, but those rates can’t be the ones reported in the surveys. The agency doesn’t distinguish between aluminum structural and aluminum panel work, and it omits carbon fiber. Nor does it wade into the issue of an hourly paint and materials rate versus just itemizing what supplies were used. Still, it’s a starting point, and aluminum gets its own rate — a big win for collision repairers in an era of aluminum F-150s and potentially all hoods and panels moving towards the substrate. There are signs insurers don’t want to pay more for aluminum work despite the amount of training and equipment necessary to properly repair a vehicle like the F-150. “Drawing a distinction for each type of rate is reasonably necessary to ensure claims are equitably settled based on similar types of labor, which varies depending on the complexity of repair,” the DOI wrote. While better than a system which theoretically lets an insurer call whatever it wants a shop, the DOI might not have gone far enough in defining what types of shops deserve to be counted in the survey. By incorporating both, the pool of qualified shops drops from 5,000 (those passing the BAR requirements) to less than 4,000 (those meeting the proposed survey inclusion threshold), according to the DOI. Insurers aren’t required to verify these items under the proposal, as the DOI felt that’d be an unfair burden. Shops completing the survey would sign off that that they meet this criteria. (2) equipment capable of applying exterior corrosion resistant primers, anticorrosion compounds and topcoats. (1) A three dimensional measuring system that can locate points with the dimensions of length, width, and height, relative to three defined reference planes. (2) A four-point anchoring system capable of holding a vehicle in a stationary position during structural and body pulls which is suitable for the types of vehicles being repaired. (3) Equipment capable of making multiple body and structural pulls. (4) A Metal Inert Gas (MIG) welder with an output of at least 110 amps for unibody repairs and an output of 200 amps for conventional frame repairs or capable of meeting trade standards for the work being performed. (5) Corrosion protection equipment for treating enclosed areas on unibodies and frame assemblies including pressurized spray equipment, flexible and rigid wands capable of reaching full length inside enclosed areas, spray heads capable of 360 degree spray application and spray heads capable of a fan-shaped pattern. 8. Subscribe to a provider of structural specifications with periodic updates covering the vehicle structure for the make, model, and year of the vehicle(s) being repaired and wheel alignment specifications for the make, model, and year of the vehicle(s) being repaired. Not only does the DOI rely on an absurdly old document (Don’t these guys have Google? ), its criteria has a few other issues. There’s no training requirements or certification included in here at all. For example, you can have a MIG welder to make the BAR happy, but not know how to use it. 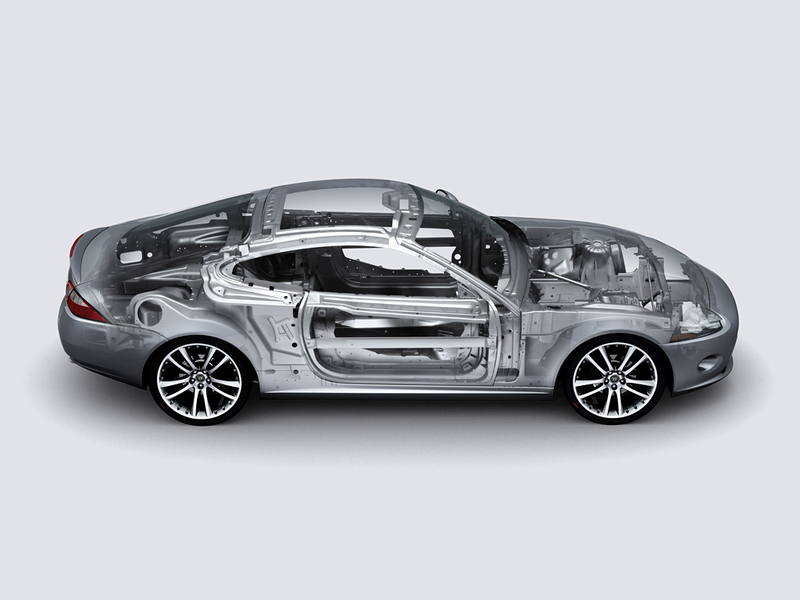 Based on I-CAR data, most collision repairers nationally aren’t certified in even basic welding — not to mention aluminum. A shop can charge aluminum rates, but not even have the gear or training to properly fix aluminum without corrosion issues. There’s also little attention paid to the evolving procedures — less straightening, more adhesives, rivets, etc. — needed in even mainstream vehicles. And you don’t need to know how to scan or calibrate anything. There’s a lot to like in what California’s planning — the California Autobody Association supports the regulations and has urged members to watch out for a possible legislative end-run — but its assumption that all of those 4,000 cited repairers are qualified to perform all six categories of rate-worthy work seems flawed. At the very least, the shop should be given a “not applicable” option for some of these rates or tighten the OEM data requirement to indicate the repairer will follow the OEM specifications or outsource the work if it can’t — not just subscribe to them. 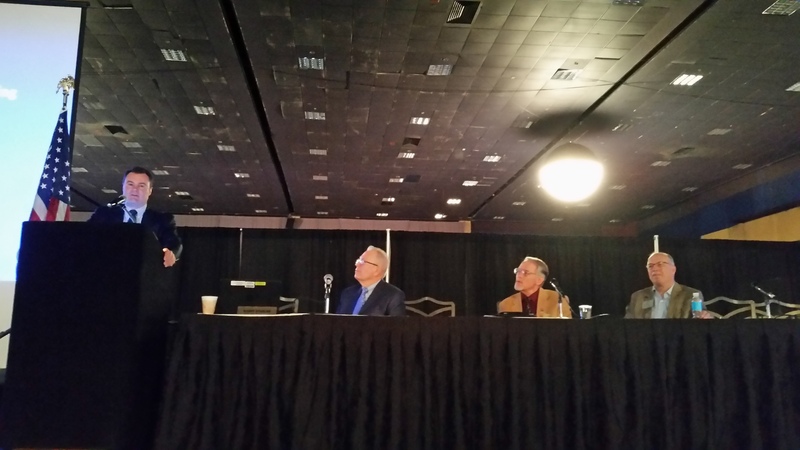 Be heard: The DOI will take comments on the idea through April 21 and hold a public hearing that day — which is ironically Day 2 of the Collision Industry Conference which will vote on the proposed Class A document. Kara Boonsirisermsook Potts, California Department of Insurance, 45 Fremont Street, 21st Floor, San Francisco, CA 94105. Phone: 415-538-4174. Edward Wu, California Department of Insurance, 300 South Spring Street, South Tower, Los Angeles, CA 90013. Phone: 213-346-6635. The public hearing will be held April 21 from 10 a.m. to no later than 2 p.m., at the first floor auditorium of the Employment Development Department, 722 Capitol Mall in Sacramento, Calif. Correction: An earlier version mischaracterized one prevailing rate calculation as the median of six surveyed shops. It’s actually the “rate at or below which a simple majority of surveyed shops charge,” which is close but not necessarily the arithmetic median. The story has since been corrected.